Steiner's 1-6x24 M6Xi Riflescope offers strength, precision, and durability. Its optical system gives users a generous 1-6x zooming capability, a wide field of view, and bright and clear images, thanks to broadband anti-reflection coatings. For making accurate shot placements, the riflescope also has an illuminated Rapid Dot 5.56/7.62 reticle with two short horizontal posts around an illuminated target dot and a short vertical post with ballistic subtensions. The reticle lies in the second image plane and has a minimal footprint on the field of view. For matching the brightness to the environmental conditions and your preferences, the scope has a rotary brightness knob with incremental adjustments and intermittent off positions. The reticle is parallax free at 328 feet. The anodized aluminum housing is filled with nitrogen and sealed for fog and waterproof performance and will endure temporary submersions to 33 feet. 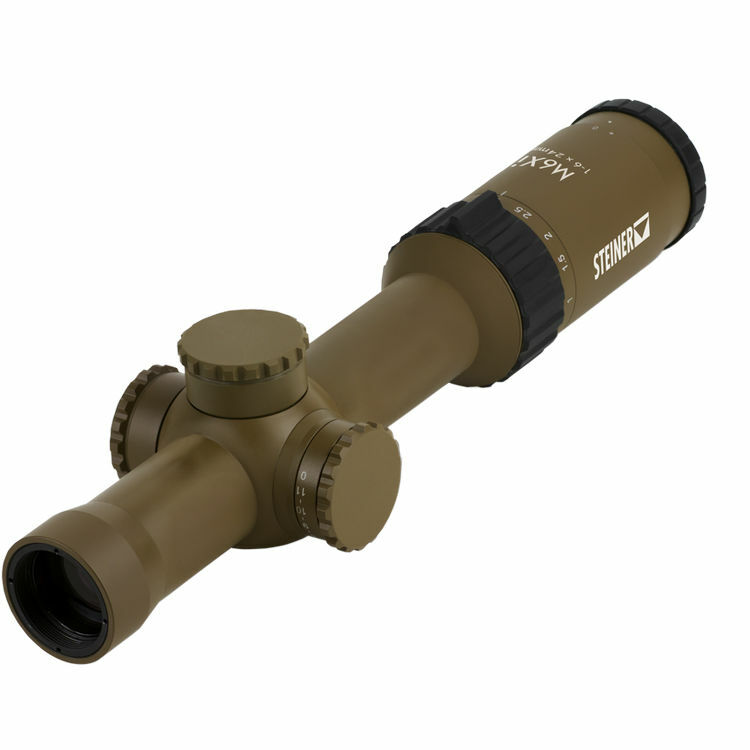 It also features a 30mm maintube, graduated exposed windage and elevation turrets, and an eyepiece with a knurled zoom ring. The windage and elevation turrets are resettable to zero and have a 32 MRAD elevation range, a 16 MRAD windage range, and 1/10 MRAD click adjustments.